Decide how many place settings you’ll need. Service for 12 guests is traditional and I think that's the best option as all bases are covered and you're not caught out if you have a big dinner party. Look for durability. Make sure dishes you plan to use every day are safe for use in the dishwasher, and ideally for the microwave, and oven too as it just makes things easier. Value for money. Cheaper is not always better but equally you don't want to spend a fortune. It's nice to perhaps have a couple of special pieces. Shopping around is a good idea - is there a high-street dupe you can find for a designer range? Consider an array of materials. Porcelain is delicate in appearance but surprisingly durable. 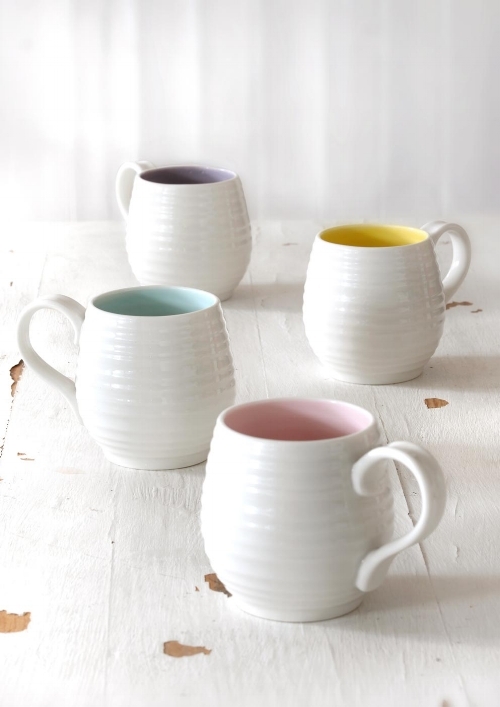 Stoneware is heavier than porcelain, and good for entertaining whilst Earthenware often comes in vibrant colours. One watch out - stoneware and earthenware, boast a rustic appearance, but can be more prone to chipping than porcelain. Make sure your pieces reflect your style sensibility. 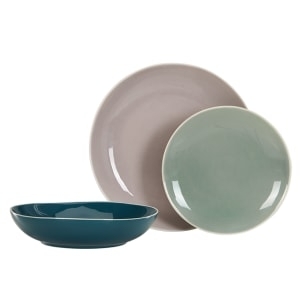 Hold out until you find dinnerware that suits your personality. Now you've thought about all of those, here's my edit. I have the polka dot design for my dinner plates, side plates & bowls but have also started to add a few other patterns. At the moment, it's just the side plates, but I kind of wish I had a mixture of patterns. The cream-coloured earthenware means the base colour is the same for each design which makes mixing & matching the patterns really easy, allowing you to have an eclectic but cohesive set. Emma Bridgewater always have a good range of factory seconds and many of my pieces are not quite perfect but you'd never really know! Although, don't make the same mistake I did; upon opening the box my crockery was covered in lots of black marks. Whilst I had ordered factory seconds I thought that was a little extreme. It turns out, the black marks wiped off and they were just there to show the imperfections! Panic over. Simple White crockery is always an easy go to. Sophie Conran for Portmerion is my favourite as it blends the simplicity of whit with interesting texture. I love the irregularity of the pieces meaning the bowls are not quite round. It is a little bit pricey at £136 for. 12-piece-set so I am always looking for similar, better value options and I think I've found one!! Sainsbury's have a VERY similar style and it's £35 for a 12-piece-set. Just a casual £101 saving! Can you even tell which is which? That being said, I still love the Sophie Conran range and it does feel special when it's used but it's nice to know I can buy a cheaper version for everyday use. And now for something a bit different. It's as much of a recommendation of a fabulous place to visit on holiday as it is some of my favourite pottery. If you have not heard of Earthworks Pottery before I'm excited to share it with you. I was lucky enough to enjoy family holidays in Barbados as a child so the island really does hold a special place in my heart. Over the years, I have built my collection and every time I use any of the pieces, it brings back lots of happy memories. Earthworks is a production pottery in Barbados. Established in 1983 by Goldie Spieler, Earthworks is now run by her son David, along with the capable Earthworks staff. Red clay ceramic pieces fired to stoneware temperatures make their pottery ideal & fully functional. They have 34 designs and so many different pieces from bowls to coasters, bathroom accessories to plates and can even take commissions to create a bespoke house number or tiles for your home. Commemorative pots are one of their specialty areas. 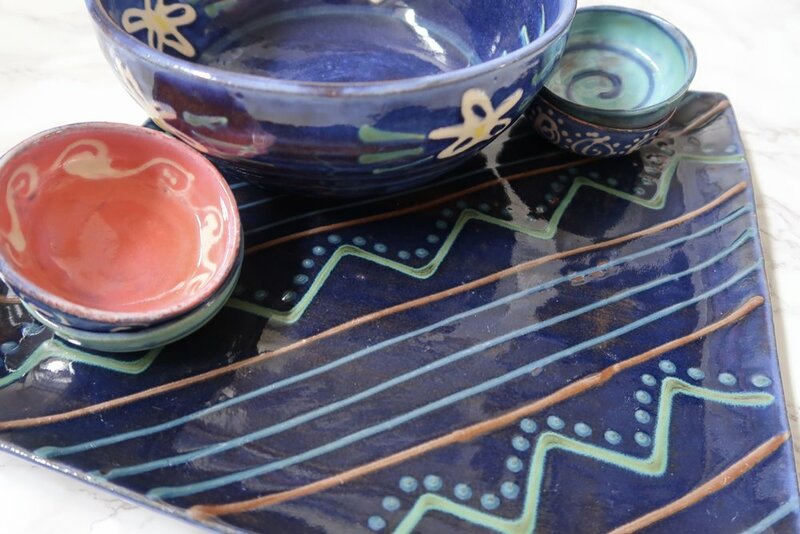 Everything is hand-finished and hand-decorated with their underglaze colours. All products are lead-free and food safe plus everything is dishwasher and microwave safe which is very important in my book! If you are lucky enough to have a holiday to Barbados do pay them a visit, you can see the craftsmen at work and pick up your own pieces. Next door, is On The Wall Gallery where the best of Barbados' art is available and the Arthouse Cafe which enjoys an open veranda overlooking the valley, next to the bamboos, where you can chill out and eat while you enjoy the cool breeze. And finally, there are hand-made batiks available and being made at the Batik Studio and a fabulous gift emporium, The Ins and Outs, selling a locally produced range of foods, condiments, linens, soaps, fine crafts and more. Well worth a visit so put it on your list. I hope you enjoyed reading and might have found a piece or two that takes your fancy. I would love to hear from you if you do buy anything or if you have a brand I should try, so do get in touch.